Chickens, Anyone? (Blurb #1), originally uploaded by Eric Jeschke. 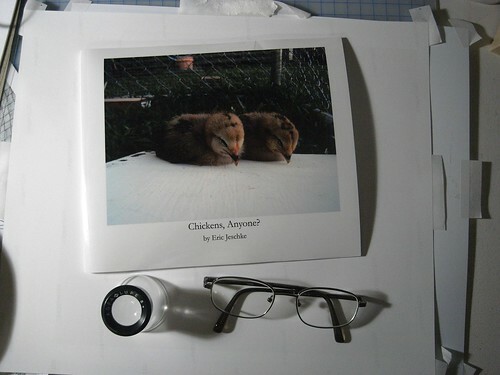 My Blurb edition of Chickens, Anyone? showed up at the door yesterday. My first impression is favorable: the pictures look crisp, color is more or less correct (modulo the more muted palette of printed reproduction). Binding and alignment are a little on the poor side, but then this is one of the least expensive of their offerings (softcover, “regular” paper). Upon examination with the loupe, and comparing closely with the Viovio book I had done last year, I can see that the halftoning pattern is more noticeable on the Blurb book, and yet the pictures to the naked eye look more clean and less “muddy” than on the former. It’s a bit of an apples to oranges comparison, because last year was black and white, however, the same camera in each case was used. I’m tempted to get this year’s book printed at Viovio to compare. Text is nicely rendered, and without any traces of smudging. The 10 point font, which looks miserably small on an online PDF next to the huge images, shows up fine in the high 300 dpi resolution of the book. The cover has a nice glossy finish, but my copy was marred by a few small scratches. I think I’d recommend the hardcover for this reason. Overall, a positive impression. I’m expecting another version any day now that was done in LaTeX. I’ve been meaning to blog about that, and maybe I’ll wait until that version arrives to comment further. Overall, I’m pleased with the PDF to book process at Blurb and the Blurb product. Recommended.